Endophytic microbes including bacteria and fungi inhabiting in seed tissues have recently gained significant importance owing to a diversity of roles that they play and eventually resulting in improved plant growth as well as plant fitness. Some of the major roles played by seed endophytic microbes include plant growth promotion by enhanced nutrient acquisition or production of growth hormones, nitrogen fixation, phosphate solubilisation, and protection against pathogens as well as abiotic stresses. Since, rice is one of the important staple crop across the globe, there is a great need to explore and decipher the roles of the endophytic community present inside it. 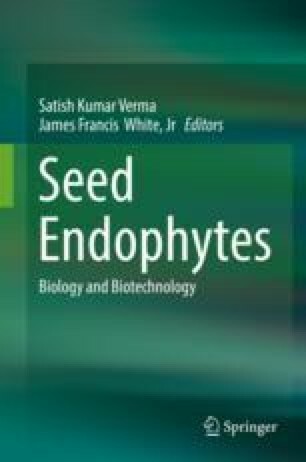 This chapter focuses on the diversity and distribution of rice seed endophytes, their transmission along with the various functional roles that they play inside the plants with an aim to provide deep insights on rice seed endophytes as plant growth promoting and biocontrol agents. The authors are grateful to the Department of Plant Biology, Rutgers University, NJ, for research facilities. SKV thanks to UGC, India, for providing a Raman Post Doctoral Fellowship No. F 5-11/2016(IC) for the year 2016–2017 to work in the USA and support as grant, Project-UGC-BSR startup-M14-26. The SKV and RNK are also grateful to the Head and Coordinator of CAS and DST-FIST and PURSE of Botany, BHU, Varanasi, for providing facilities and leave to pursue endophyte research. The authors are also thankful for support from the John E. and Christina C. Craighead Foundation, USDA-NIFA Multistate Project W3147, and the New Jersey Agricultural Experiment Station.